YubaNet continues to support anthropogenic global warming, with cheerleading by Mr P, the Union’s Former Editor. Science is a method. The scientific method is pretty straightforward. You propose a hypothesis, calculate what facts in the real world must be true if the hypothesis is correct, and then check the hypothesis against reality. If the facts do not support the hypothesis, it is wrong. Climate alarmists stand the scientific method on its head. When their theories, as expressed in climate models, conflict with reality, they conclude that something must be wrong with reality. The science our local lefty supports is a combination of politics and religion. A proposition that cannot be falsified by experience is not a valid scientific proposition. By far, the most rigorous, comprehensive data on global temperatures come from satellite measurements of the atmosphere (mid-troposphere), which is where the greenhouse effect takes place. The measurements started in December 1978 and the temperature estimates are calculated by two independent groups, who closely agree. These data are independently supported by four sets of direct temperature measurements from weather balloons. 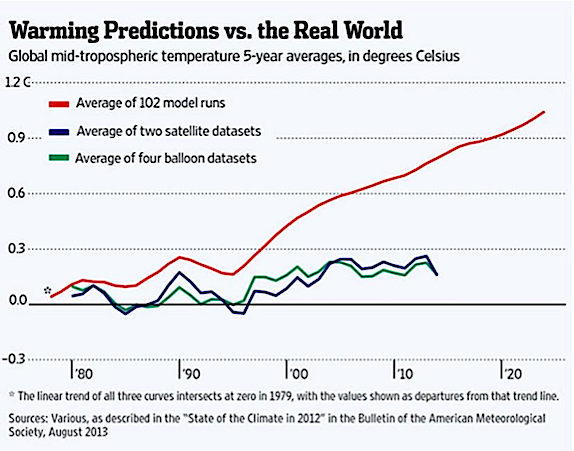 We can see below the direct comparison between 102 model runs and real world observations. According to a recent UN Report the atmospheric levels of greenhouse gases reached record levels in 2013. Concentrations of carbon dioxide in the atmosphere between 2012 and 2013 grew at their fastest rate since 1984, according to the UN Report. “According to the bulletin, the globally averaged amount of carbon dioxide in the atmosphere reached 396 parts per million (ppm) in 2013, an increase of almost 3ppm over the previous year.” Details HERE. If we use real science, not progressive dogma, the real world data proves that the anthropogenic warming hypothesis is not valid. 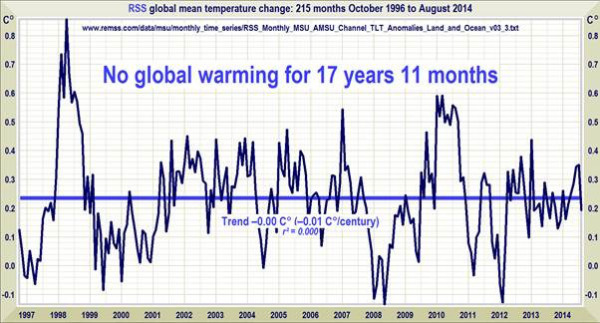 They continue to rely on computers models that have been proven wrong by the real world facts, those models did not even identify the current pause. I am not sure that our former Union editor is smart enough to understand real science. H/T to PowerLine and Christopher Monckton of Brenchley for graphics. This entry was posted in Analysis, Climate Change, Local, Weather. Bookmark the permalink.